Reader's Digest, once the best-selling consumer magazine in the United States, has stopped the publication of its Chinese version after about four years and six months of operation. Subscribers are receiving e-mails and text messages since last month, informing them of the closure and about refunds. "We are sorry to inform you that the magazine suspended publication due to uncontrollable factors," the notice said. Visitors of the homepage of the Chinese magazine www.puzhi.com.cn are redirected to the Hong Kong website of Reader's Digest. The magazine's management declined interview requests yesterday. Though the magazine didn't specify the reasons for the sudden closure, industry insiders blamed the failure on the magazine's unclear readership targets, weak promotion and problems in the publishing industry. "The magazine entered the Chinese market too late," said Yan Feng, associate professor of the Fudan University's Department of Chinese Language and Literature. The magazine, which includes stories on people, culture, travel and health, was very popular in the 1980s when people had no web access, he said. Some readers complained that the magazine had too many translated articles while the localized content was not compelling. 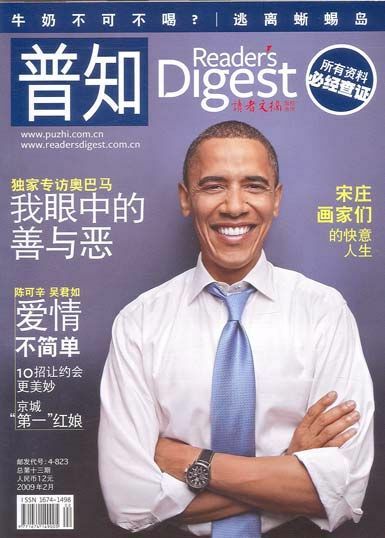 Reader's Digest began to publish the monthly magazine Puzhi on the Chinese mainland in 2008 with the cooperation of the Shanghai Press and Publishing Development Co.
Puzhi, which means "universal knowledge" in Chinese, is the same size as Reader's Digest in the US and features similar content. Wang Peng, a brand-marketing expert, said in his blog that Puzhi lost ground in the market mainly due to its unclear orientation. "The magazine wanted to suit everyone's taste in a family," he wrote, "But in China, values of parents and children vary a lot. ... It lost all groups of readers in the end." The high cost of 12 yuan (US$1.89) for each copy suggests the magazine is targeted at white-collar workers while the content is more family-oriented, he said. Despite the setbacks, the magazine didn't seem to let up in its efforts to seek opportunities in the big Chinese market. In the notice issued to readers, the magazine called the action "suspension" instead of calling it "closure" and added, "We will contact you after the publication is resumed." Time Weekly reported that the magazine may keep publishing online digital copy in the Chinese market in the future. An employee who answered the customer hotline said the closure of the publication is related to the US headquarters' bankruptcy and restructuring in 2009. "The magazine will not be back on the streets very soon," she said. "It's not likely to happen within the year." Reader's Digest has stopped the publication of its Chinese version after about four years and six months of operation.